The Minenraumer was designed for leading panzer formations through the immense minefields planted by the Red Army on the Eastern Front. Although only one prototype was ever built, and it never saw combat, the vehicle provides a very unique modeling subject. I discovered the Minenraumer through via a website link, and it sparked my interest in building a scale model of it. Luckily I was able to find an RPM 1/35th scale Minenraumer on eBay for half the MSRP. Despite the cartoonish cover art, and a relatively unknown manufacturer (to me) I was very optimistic for the build. When first looking into the box one would believe this to be a relatively simple and quick build. 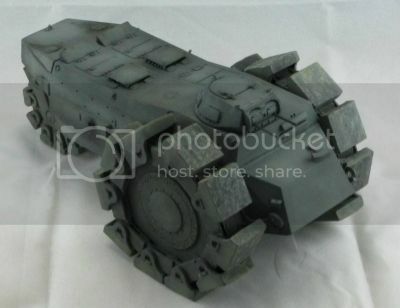 There are a total of 6 sprues; one for the hull, one for the turret, and four for the massive wheels. The instruction sheet (almost exclusively written in Polish) provides a diagram with all six sprues and indicates the part numbers. None of the parts on the sprues have part numbers stamped near them, so there is a constant need to refer to the diagram. The problems with this kit begin to surface at the very start with Step 1; which covers the assembly of the two halves of the rear wheel. The instructions label the parts incorrectly, having you piece together the front wheel sections instead of the rear. Steps 2 & 3 are also mislabelled with incorrect part numbers. There is also an issue with part number 10 - which are the link pieces for the wheel assembly first seen in step 3. There are in fact two different pieces on the sprues, however these are listed as the same part number in the instructions. Once I figured out the proper parts for each step, the piecing together of the whole wheel assembly took some considerable time and effort. Getting past the shock of the foul up with the first steps you come to the hull assembly. There are no 'pegs & holes' on any piece of the kit to assist in assembly, so you are always trying to affix two flat surfaces together. This might not be that much of an issue on most other kits, but the hull assembly for this kit was terribly warped. I am not sure if my kit in particular was more warped than others, but it almost seemed irreparable. Getting all five pieces of the hull glued together was really only possible with the use of superglue which kept the warped pieces from moving. Moving on to step 16, which is the addition of smaller parts to the hull, i.e. vents, lift lugs, and hatches. The hatches in step 16 feature rounded edges, yet the hole in the hull is squared off, which makes for an awkward fit, requiring much putty to fill in the gaps. The final ten steps deal with the assembly of the turret, which came off of a Panzer I. Although there was no mislabelling of part numbers for these steps, the general fit of the pieces left a lot to be desired. Step 29 - This has you build the chains leading from the hull to the rear wheel - which is supposedly how the rear wheel was turned. The kit comes with plastic individual links which you must glue together to make the sections of chains...more work than its worth. I would suggest buying some aftermarket lengths of metal chain. Step 30 - Final assembly of all sub components (hull, 3 wheels, turret) I have not begun the painting and weathering process, as I am still debating on what scheme to go with. Honestly this has been a truly difficult, yet rewarding build. My most recent builds leading up to this were all Dragon kits, which spoiled me with their ease of assembly. Between the mislabelled, warped, and ill fitting parts, it is easy to become frustrated over this kit. I think I've used more putty, and put my Dremel to work more on this kit alone than all of my previous builds combined. If you are able to push through and get this kit built, it will definitely be an interesting addition to any collection. Highs: Interesting subject, somewhat rare among collections. You really get to hone your sanding and filling skills. Verdict: Although I have only seen the assembly of the Meng Minenraumer kit in photos, it appears to be a higher quality, and better fitting kit. I would avoid this RPM kit unless you are really desiring a challenge. Copyright ©2019 text by Shawn [ SCIPIO2010 ]. All rights reserved. Thank you all for the comments! I must admit that when I purchased this kit I was still a little naive about the varying quality of brands on the market. I would love to build the Meng kit sometime in the future to do a real build comparison.